AIASF NEXT Conference Recap: Design "Thinkering"
Last week, AIASF kicked-off its inaugural NEXT Conference on Thursday and Friday. MoMa Curator Paola Antonelli gave an invigorating and provocative keynote about the increasing ambiguity and ambivalence of design in the next frontier. She suggested that Design is expanding beyond problem solving to complex critical thinking: challenging what we know and stretching out of our comfort zone in a truly disruptive way. Paola asked us to think of Design as Activism out of necessity as we ultimately will be approaching extinction given the way we are operating today. She introduced the concept of "Thinkering", which could be interpreted as a marriage of Design Thinking and Tinkering; merging strategic disruption with real world application and maker experimentation in an iterative dialogue. In reference to more effective sustainable design, she promoted examples combining biomimetic inspirations with adaptation of new technologies such as 3D and 4D printing Kinematic. And in the case of MIT's MediaLab, The Silk Pavilion explores the relationship between digital and biological fabrication on product and architectural scales. Silkworms were deployed as a biological printer in concert with an algorithmically generated pavilion using a single thread. You can view the project video below to get a sense of the "Thinkering" that Paola references. SILK PAVILION from Mediated Matter Group on Vimeo. Another exploration that Paola suggests is that of Design as a political vehicle to engage and build empathy. In her book release earlier this year "Design and Violence", Paola suggests that Design has a history of violence while the professional discourse has largely trumpeted its successes. Violence - defined as the manifestation of power to alter circumstances against the will of others to their detriment, while ubiquitous and ambivalent, has introduced new threats with the rapid advancement of technology. How can we be responsible stewards of design to leverage the ambiguity of design for positive impact while mitigating the negative effects from moving too quickly forward without understanding the power and consequence of design? With California's current water crisis, Design professionals have an unprecedented opportunity to drive change. The technologies, practices and policies we use to tackle water scarcity has the potential to set a national precedent. While the panel presented cutting-edge water technologies, we still face challenges related to policy, funding, and social norms, particularly for solutions that step beyond drilling new wells or basic conservation measures. One of the most important aspects of our profession receives minimal focus during our years in architectural school, yet its the key component of having a viable, appropriately compensated, enjoyable career - and that component is BUSINESS. Lean management is the long-term approach where you seek small, systematic, incremental changes in your process in order to improve your efficiency and quality. While most successful manufacturers have been following a Lean approach for decades, only recently have architects begun to explore Lean management. Successful implementation is achieved not by the management team but instead from the workers themselves. The front-line staff, those who actually perform the work are the ones charged with innovating ways to speed the process, minimize risk and provide higher client satisfaction. This seminar explores how a Lean approach to financial management can be implemented in an architectural firm. As principal of the Innovation Studio at MKThink, Mark depends on big data to inform designs so that the outcome is the appropriate solution for the problem. Sometimes the issue at hand is not clear and the use of key analytics can provide answers to undefined problems. By discovering the means to transcend systemic inefficiencies of traditional building, the alignment with today’s post-industrial economy can occur. Innovative solutions correct and capitalize on these inefficiencies by applying successful analytic and technological precedents from parallel industries. Joan Williams, UC Hastings gives strategies for better negotiation. Innovative Negotiation was a newly developed seminar that leverages the science and art of successful deal making to become a more effective negotiator on behalf of yourself, your practice, and for the profession-at-large. In the session, attendees learned tactical skills to build confidence by understanding default negotiation styles and discussed ways to increase effective outcomes for various situations; performance review, salary raise negotiation, contracts and additional services with your clients. There are many situations and types of negotiation — and ultimately it breaks down to communication styles and the choices we make when we engage in these situations. Understanding the various styles of negotiation while learning when to apply these skills based on the situation is critical to successful outcomes. Mallory Cusenbery, RossDrulisCusenbery Architecture, Inc.
Tomas Alvarez, Beats Rhymes & Life, Inc. 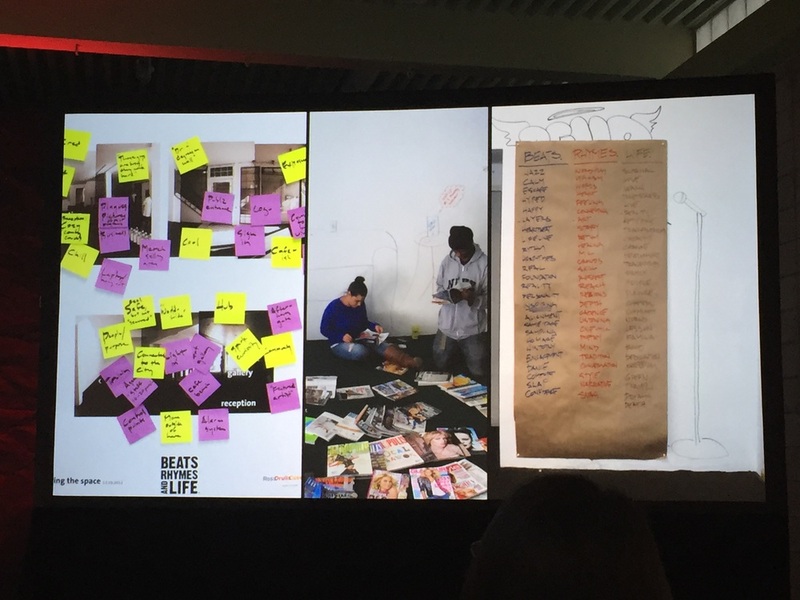 Engaging "At Promise" Oakland Youth in design process. In Oakland where youth face daily challenges to their well being, "placemaking" and "personal growth" may seem like indulgences. Communities of young people are busy coping with impacts from gun violence, teen pregnancy, high drop-out rates, inadequate healthcare and incarceration. Yet, it is in this very area where a set of important community innovations are emerging. Through concurrent initiatives in programming, mental health facilitation and collaborative placemaking design, East Bay youth are redefining themselves and the places where they live. At the heart of this are grassroots, hands-on engagement processes—using culturally relevant tools—offering a generation of young people means to build their world in their image. This is about co-creating efficacy through guided collaboration. In architecture, youth-focused participatory design is engaging young people in a generative creative process to co-design their built environment, with exciting results. In social work, hip hop therapy is offering a model for culturally-responsive approaches to adolescent mental health, healing and empowerment. Both approaches embrace the notion that youth labeled "at risk" are capable of creating, transforming and shaping their communities; both leverage similar tools to achieve this: collaborative activity groups, exercises to extract youth stories, improvisation, structures for youth creative input, documentation. The role of the "expert”—architect, therapist—is redefined, replacing top-down approaches with porous, non-hierarchical facilitator/collaborator roles. Unfortunately, I didn't get to attend Thursday's Placemaking Deep Dive. But judging from the live tweet activity (Captured in Storify Summary) there were some very active discussions about the need for Placemaking to authentically engage with communities to inspire a new activism for "Citizen Planners".